Sautéed pieces of fresh chicken and corn paste wrapped in Banana leaf and steamed. Fresh mashed potatoes filled with sautéed beef, rolled in seasoned potato flour, deep fried and served with onions & green garnish. Boiled potatoes, eggs, and black olives on green garnish, topped with “Viajero” cheese sauce. Avocado stuffed with chicken and salad. Sautéed shrimp marinated with garlic sauce & broiled potato. Squid seasoned with flour and bread crumbs, deep fried and served with tartar sauce. 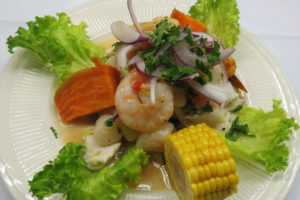 Fish marinate in lemon juice; Shrimp, scallops, fish and squid, marinated in lemon Juice; Served with sweet potato and corn on the cob. New York Steak marinated with garlic & wine sauce. Served with rice & french fries. 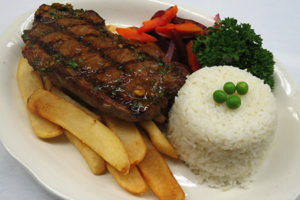 New York Steak (10oz) Grilled to your taste, served with french fries & rice. New York Steak (10oz). Grilled with black pepper sauce, served with vegetables and rice. New York Steak (10oz.) Grilled to your taste, served with beans, rice, french fries, plantains and a fried eff. New York Steak (10oz) grilled in our zesty blend of red onions sauce, with wine and green peppers, served with rice and boiled potatoes. New York Steak (10oz) grilled to your taste, served with plantains, fried eggs, rice and french fries. New York Steak (10oz) grilled with marinade sauce and capers, served with boiled potatoes and rice. Chunk of beef sautéed with red wine & cream sauce. Served with rice and fried potatoes. Beef steak to your taste, served with rice, french fries, plantain and fried egg. Heart brochette, served with fried potatoes and salsa criollo. Short ribs in stew flavored with cilantro, served with rice and beans. Marinated pieces of fried pork, served with yucca and salsa criolla. 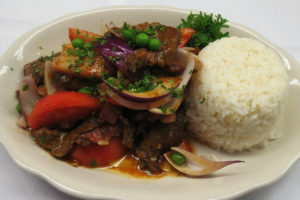 Tripe stew served with potatoes and rice. Spaghetti and fresh beed sautéed in olive oil, red onions, tomatoes, and fresh herbs. French boneless chicken sautéed in olive oil, red onions, tomatoes, french fries, served with rice. Grilled chicken served with french fries and rice. 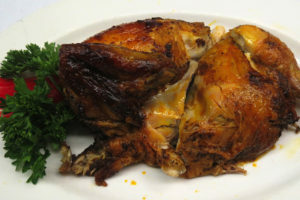 Fresh chicken breast seasoned with bread crumbs, deep fried. Served with rice, French fries & tartar sauce. Fresh boneless chicken sautéed in wine & mushroom sauce, served with rice & vegetables. Sautéed shrimp with fresh tomatoes, garlic sauce wit boiled potato and rice. Fresh squid seasoned with bread crumbs, deep fried and served with tartar sauce. 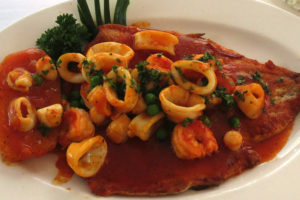 Grilled filet with fresh seafood sauce, served with rice & boiled potatoes. Grilled filet of fish served with fried potatoes, rice and salsa criolla. Grilled filet of fish made with zesty blend of red onions sauce, white wine, and green peppers. Served with rice and potatoes. Grilled fish with bread crumbs, served with french fries, rice and tartar sauce. Grilled boneless talipia served with fried potatoes, rice and salsa criolla. Filet of fish sautéed with shrimp and cream sauce, served with boiled potatoes and rice. 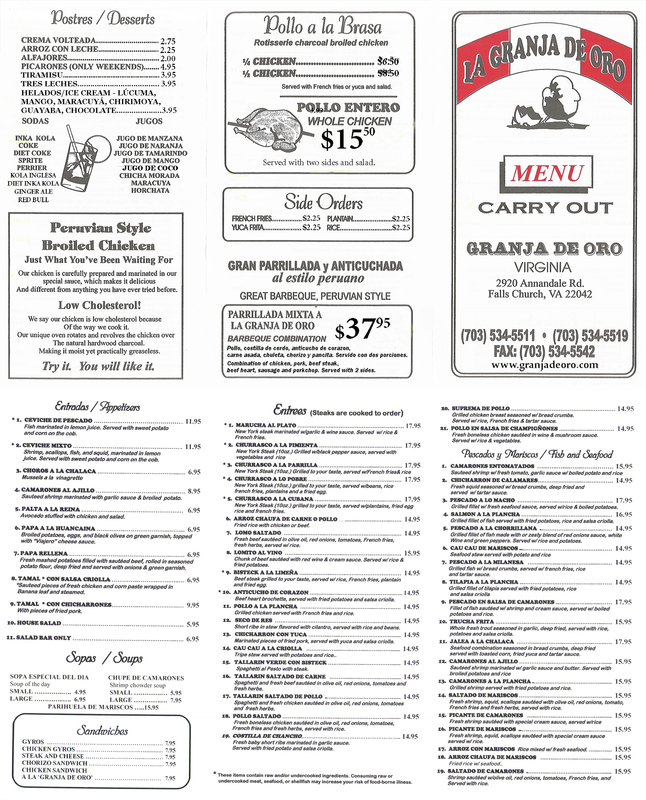 Whole fresh trout seasoned in garlic, deep fried, served with rice, potatoes and salsa criolla. Sautéed shrimp marinated with garlic sauce and butter. Served with broiled potatoes and rice. Grilled shrimp served with fried potatoes. Shrimp sautéed with olive oil, red onions, tomatoes, French fries, and served with rice. 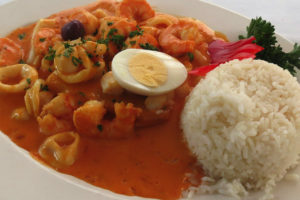 Fresh shrimp, squid, scallops, sautéed with olive oil, red onions, tomato, French fries and fresh herbs, served with rice. Fresh shrimp sautéed with special scream sauce, served with rice. 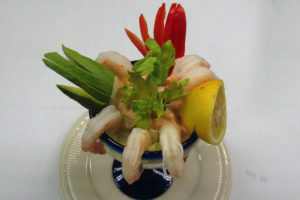 Fresh shrimp, squid, scallops sautéed with special cream sauce served with rice.